On Wednesday the 23rd of May the DRW team visited Individuell Människohjälp. IM is a Swedish development partner that has existed since 1938 and was founded by Brita Holmström. The international work of IM focuses on areas within education, health and self-provision while the emphasis within Sweden is on mutual integration. IM’s underlying methodology is based on a philosophy where the individual is their own driving force to self-help, “IM help people to help themselves” says Stephanie Cerqueira, market coordinator at IM, Stockholm Region. Amanda Windolf, activities developer and communication specialist at IM Stockholm, invited the DRW team with the purpose of us getting to know each other’s businesses and brainstorm areas for potential cooperation. Before long, it became apparent that DRW’s work for mutual integration of migrants with non-normative abilities has a similar foundation as IM’s. Amanda Windolf believes that IM works for mutual integration in Sweden. She explains that discrimination and deficient resources for migrants make people born abroad particularly vulnerable and at risk of being socially excluded; therefore, IM’s work is based on human encounters. Rokibath Alssane, activities developer and project co-worker at Duo Stockholm, carries on talking about discrimination on the ground of ethnicity that still is an obstacle to inclusion in the Swedish society. Zuraiya Longdewa Boularbah, activities developer and project co-worker at Duo Stockholm, interpose that IM want to counter racism by creating pre-conditions for increased awareness and a more open society. She explains that they, for example, within the project Duo Stockholm want to open doors so that migrants and established Swedes can meet. Duo Stockholm is about a voluntary, social contact where both partners are interested in meeting each other. Among other things, IM has created a manual on how to arrange ”språkfika” [coffee with languages] where people meet and learn different languages. Emili works together with Volontärbyrån and produces the manual of associations for migrants, a manual that promotes club activities, interests and democracy. She says that they would be interested in cooperating with DRW to produce better and more accessible associations where the disability rights perspective shapes activities at all levels. DRW’s work for mutual integration is also about equipping civil society, authorities and community organs responsible for establishment/integration with knowledge about the situation for migrants with non-normative abilities; how to include a disability rights perspective in every decisions; practical checklists for implementation with established methods that promote justice/equality, self-determination, participation and democracy. 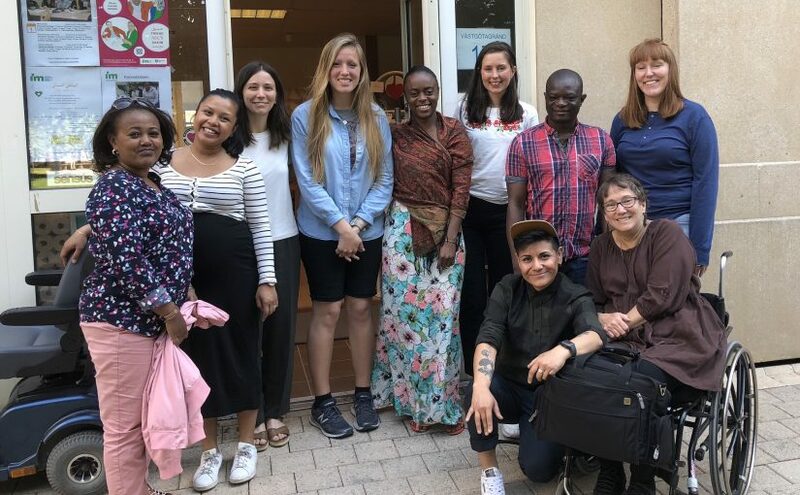 In the same way, DRW also wants to equip every disabled newcomer with knowledge adapted to their capacity, produced through methods where disabled migrants become part of shaping the solutions from their own experiences and capabilities. DRW also wants to support and strengthen migrants possibilities to understand the rights and obligations of a person residing in Sweden. The vantage point of DRW’s work is empowerment, self-determination, increased security, feeling of belonging and agency through peer support, the method through which people with non-normative abilities themselves come forward and provide support and advice by sharing their experiences, strategies and stories, to those new to the situation. The focus in peer support is on individuals as agents and owners of their experiences and stories. IM’s work with migrants in Sweden is of great interest for the DRW project. Especially exciting is the project “Rådrum” [room for advice] which offers free, impartial and confidential counselling, and provides societal guidance for migrants. IM believes, just as DRW, that it is important for Sweden to produce resources that can increase trust and participation in society; promote the ability to take control over your life and realise your own potential. Forums needs to be created where more individuals that are part of the Swedish community can participate in how this will be and has been shaped to accommodate everybody. DRW is looking forward to long-lasting and efficient cooperation with IM. Next Next post: Disabled Refugees Welcome at the Almedalen Week!